The wars of the 1990s proved that nations capable of leveraging space-based platforms in operations enjoyed a decided advantage over their adversaries. Allied success in the 1990-91 Gulf War, for example, involved the successful military application of the Global Positioning System (GPS), space-based imagery, theatre missile warning and defence, satellite communications, and space situational awareness. 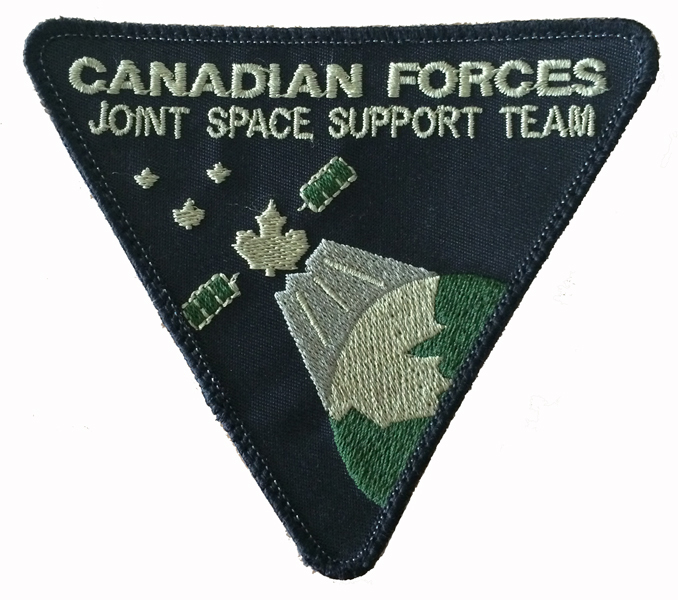 These space systems continued to evolve throughout the 1990s, and towards the end of the decade the Canadian Forces (CF) undertook a series of its own initiatives designed to operationalize various strategic level space-based assets within its field forces. 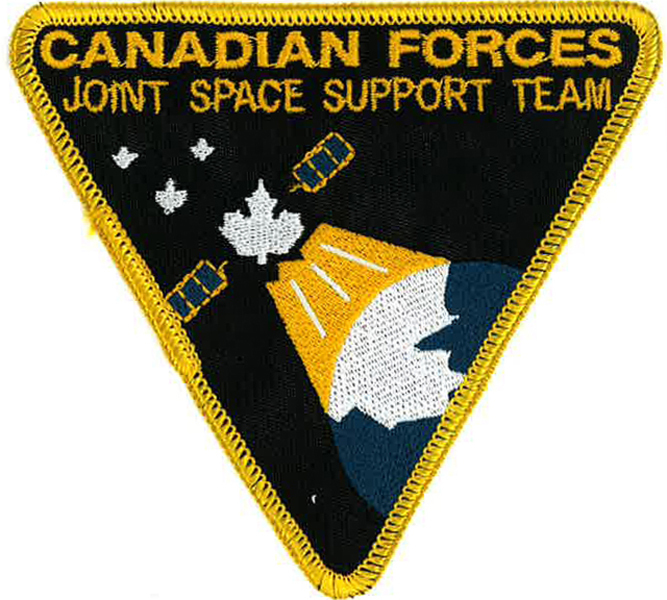 These efforts included the creation of an experimental CF Joint Space Support Team (JSST) within the CF Joint Operations Group (CFJOG) at Kingston, Ontario in 2001. Formed in early 2001, the JSST initially consisted of only two members (1 officer, 1 NCO), with a third junior NCO joining the team later in the summer of 2001. Throughout its brief existence (2001-2004), the original JSST never included more than four members at any time, typically 2 officers and 2 senior NCOs. Each member was responsible for specific area of expertise. The author served as the only officer commanding throughout this period. As an experimental team focused on integration, testing, and evaluation, in addition to technology demonstrations and real world operational support, the JSST was also tasked to trial a variety of new combat uniform patterns and badges. The first members arrived in their posts still wearing the Cold War era olive drab combat uniforms, but this soon changed when the CF introduced the new CADPAT combat clothing the following year. Still, even though the team operated in a defined area within the CFJOG headquarters, unlike the CF Disaster Assistance Response Team (DART) officers and NCOs it remained difficult to visually discern at a glance exactly who the JSST members were. The idea of creating a specific insignia identifier to be worn by JSST members was first raised by the CFJOG Chief of Staff at a weekly coordination meeting in April 2001. The CFJOG itself had just recently formalized its own new crest and other specialized units then under command, such as the CF DART, were already wearing special insignia in the headquarters on olive drab brassards. It was therefore suggested that while the JSST was attached to the CFJOG, it should adopt a similar practice for ease of identification. The author forwarded the request back to the Directorate of Space Development (D Space D) in Ottawa, which after a short period of consideration replied favourably to the idea. The author was subsequently tasked to propose a small number of designs for consideration. There were caveats applied of course. D Space D had expressed a desire that in order to best promote both the team and the project that it was a part of the final insignia design should easily stand out from other traditional military styles. D Space D therefore directed early on to come up with something unique and therefore to avoid using the typically popular 4-inch diameter circular patch as the basis for the team’s insignia. 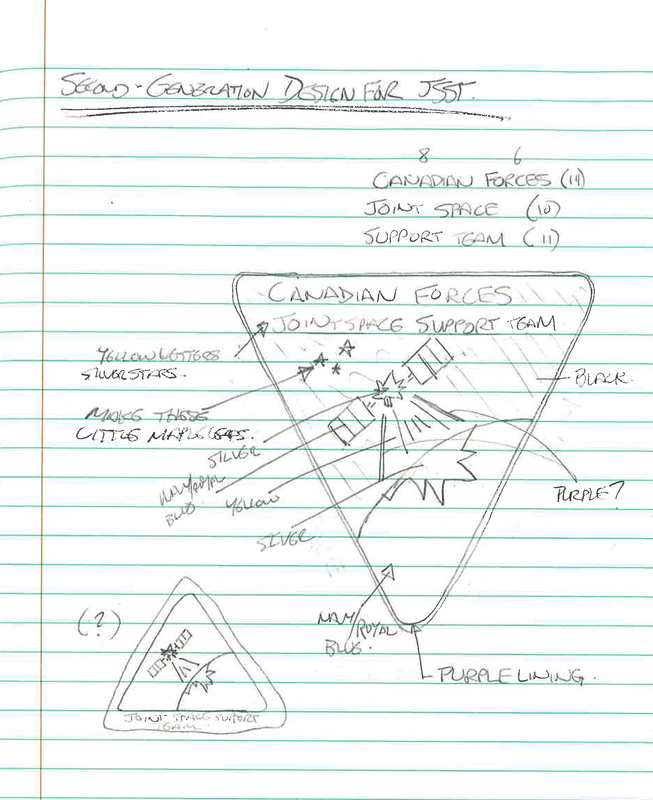 The author consulted various sources for other ideas, including the variety of insignia then in use by Canada’s civilian space program. This proved helpful as space programs employed a wide variety of shapes depending on the program, project, or mission. 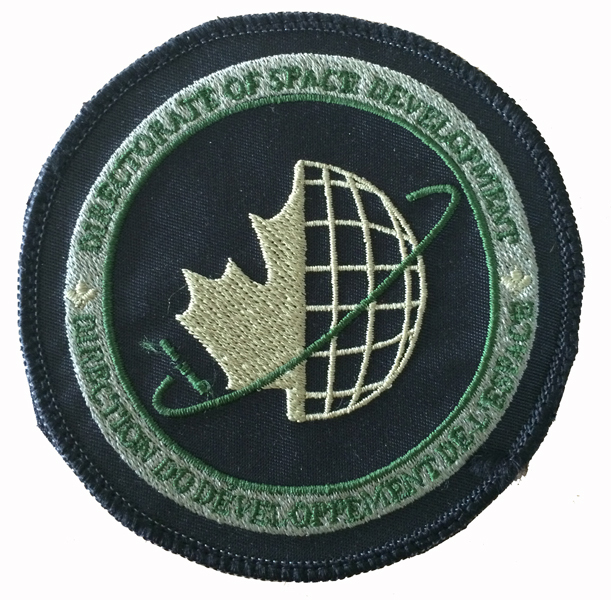 D Space D also directed that any and all design proposals should align the JSST insignia with D Space D’s own directorate logo in order to strengthen the Canadian defence space community’s overall ‘brand’. Several scribblings and conversations later the author arrived at a final proposal for the JSST insignia. Like all Canadian military patches it seemed necessary to include a maple leaf. With this in mind the remainder of the design was inspired by a report the author had recently written for D Space D simply titled ‘Maple Leaf in Orbit’. The final design was approved during the summer of 2001, and local companies were consulted soon after to produce the patch for the team. Due to the fact that the JSST was an experimental unit and would only ever consist of a very small cadre of perhaps less than a half dozen personnel, the JSST insignia were produced in very limited numbers. A single proof of design patch was made for the author’s approval – this unique patch has a black backing and special tag – with all remainder production full colour and olive drab patches having a off-white cloth cover backing (Figure 5). A private contractor made a total of 100 patches in each variety. Initially worn on a brassard in similar fashion to the DART staff members, each team member received two full colour and two subdued pattern brassards to wear on the new CADPAT uniform. 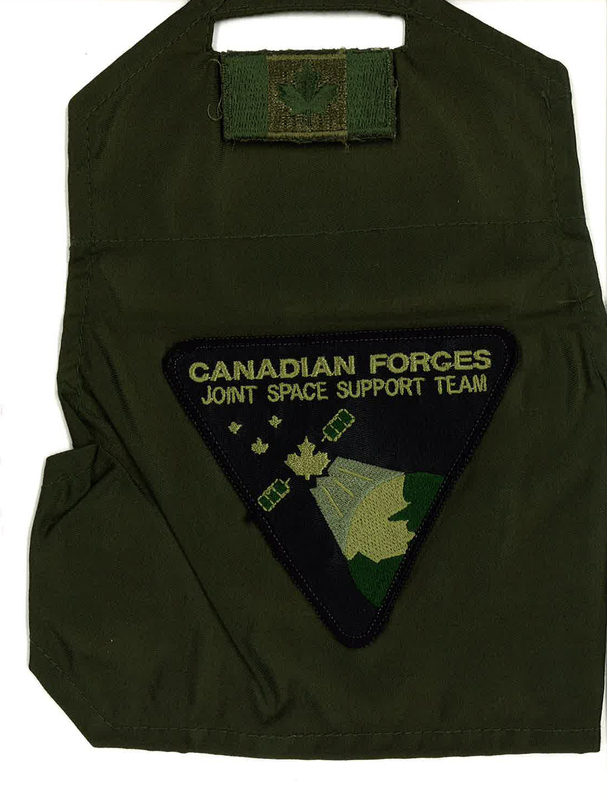 As part of the larger CF joint experiment, in early 2002 the JSST was directed to begin trialing an air force flight suit uniform in lieu of army CADPAT for the remainder of the year. This resulted in the brassard being replaced by Velcro backed insignia that could be applied to the suits. Typically full colour insignia was worn on these uniforms while in garrison, switching to subdued pattern patches when on exercise or in support of operations. These outfits proved popular with the team as well as the joint community, and they remained in use until the end of the initial trial in 2004. Each member of the JSST received approximately a dozen each of the colour and subdued pattern insignia for the various uniforms tested throughout the project; this accounted for about half of the total number produced. 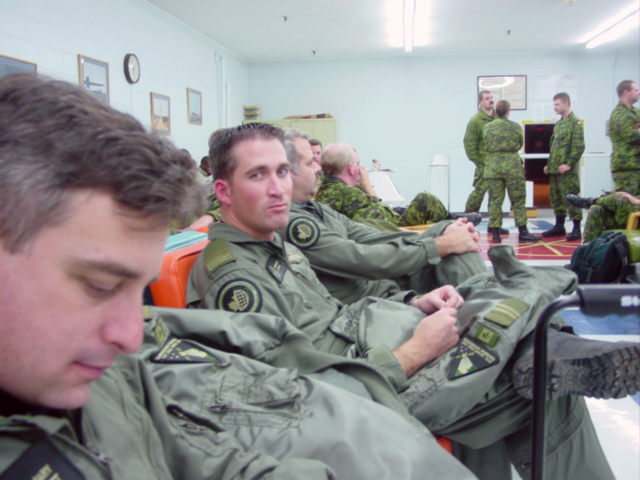 The remaining patches were dispersed amongst various CF personnel, the two USAF exchange officers attached to the project between 2001-2004, as well as a handful of DND civilian project managers and defence scientists also involved with the project. A very small number were handed out as tokens of appreciation during various official visits to the team, thus a few have made their way into the United States and elsewhere. When the initial team was stood down in 2004, none of the patches remained in stocks and no more were produced. 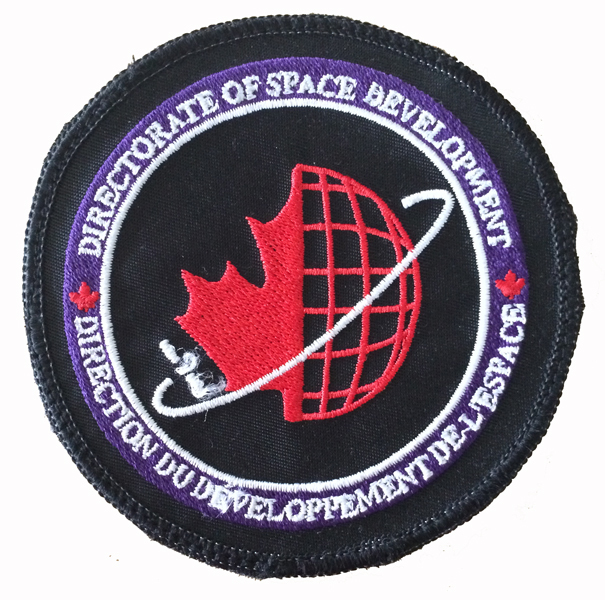 Interestingly, the original JSST design is still in use by DND today, except that it has been subsequently altered to reflect the acronym of a new joint organization with a different name assigned within DND’s Director General Space (DG Space). Perhaps what is more interesting even is the fact that in recent years the author has seen various reproductions of both the colour D Space D patch and the colour JSST patch appear for sale, with a few appearing from time to time on E-bay and other auction or militaria websites. These generally tend to be of much poorer quality than the originals, and since there was ever only a single batch of originals made, any other known design variants of the patches illustrated in this article may be considered to be reproduction patches. During the brief existence of the CFJOG from 2000 to 2005, both the DART and the JSST stood out from the remainder of the headquarters group in terms of distinct insignia designed for a specific purpose. Because it still exists today as a special organization much has been written concerning the insignia of the DART, while the original JSST has since fallen entirely into total obscurity. This short article has sought to rectify that imbalance just a little, by shedding new light on the worn insignia of one of the modern CAF’s little known units. Thanks Andrew. Documenting the origins and history of insignia is important for both collectors and historians. It will help sort the wheat from the chaff. Well done.